Promotional products are just one facet of a successful branding strategy; they are a simple, yet powerful way to brand your business, and they get results – but not in isolation. Promotional products are just one of the critical components of a marketing campaign – they generally can’t exist alone. Today’s businesses must employ an integrated, multi-channel marketing program to gain a competitive edge, and coordinating those channels takes effort and flexibility. Incorporating a simple branding message via a promotional product is a great way to drive home your integrated marketing plan. Let’s consider a custom flash drive, for example. Don’t think of promo items as a cast-off of your program. Think of the product as an integral spoke in the marketing wheel. You’ll be more likely to get big results from a program if your custom flash drive is more than just an afterthought. Make room in your budget for the promotional product. Success not only requires adopting a mindset about your promotional flash drive, but you also need to put your money where your mouth is. Money talks, and if you’re serious about getting a big impact with a promotional product, your budget should offer proof of such. Create a product that sends a targeted message to a targeted audience. The audience profiles and value proposition that form the basis of your multi-channel marketing plan should also be the foundation upon which you choose a custom USB. Determine the end result. There are a lot of ways you can entice consumers to respond to your promotion. Consider whether this your product is a shareable item, or perhaps one that you want your prospects to use often. You can incorporate this message into the customized flash drive branding. Know how the product fits into the overall campaign. This knowledge will help you to know the best time to release the promotional product. Will it be in support of a TV advertisement? Will the product support a conference? Or, Will you give personalized flash drives away at a trade show? Branding your business doesn’t have to be complicated. Determine your marketing channels, and then consider how a promotional product fits into that equation. Promotional products leave consumers with a lasting impression, driving brand recognition and traffic. Don’t let the opportunity to use a simple, yet effective branding method slip out of your hands. i really like the jacket usb. i need a quote on 50/100 2-16gb. Thank You.. 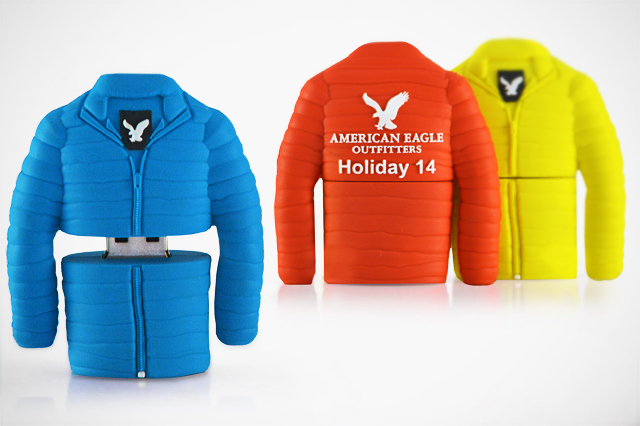 The USB jacket was a custom shape created by American Eagle, however, you can create your own custom USB Flash Drives. Please email sales@customusb.com for a quote on a potential order or go to https://www.customusb.com/custom-shape-flash-drives/ and submit a quote.